There aren't many things more terrifying than the animatronic animals at a pizza parlor. Maybe it's the dead stare in their eyes, or the sinister smile stretched across their oversized heads, or the creepy voices that are paired with their already frightening appearances... Most likely it’s the combination of all three. We get chills just thinking back to the last time we had a face to face run in with one of these awful night terrors. So, if scary is what you're going for this Halloween, look no further! 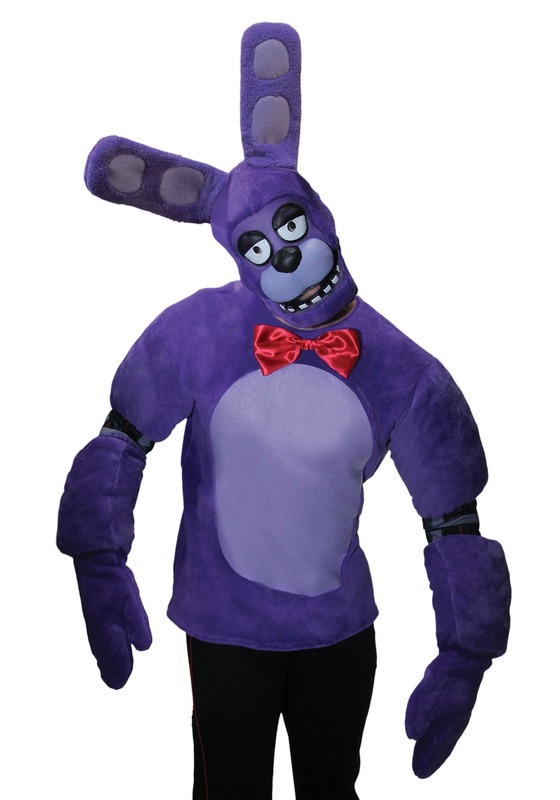 This Bonnie Costume is sure to scare the whole block. This demented version of a bunny will certainly raise the 'hares' on the back of anyone's neck. Especially when you walk around the neighborhood at nightfall not offering a single word to anyone but rather just a lifeless stare and maybe a haunting laugh. This robotic animal may be an entertainer during the daylight but don't let others be fooled by the bowtie. Putting a smile on people's faces is not what Bonnie hopes to accomplish in the dark of night. No, Bonnie, or rather the ghost that possess huge purple rabbit, is out for one thing and that just 'hoppens' to be revenge. So make sure you're not suddenly taken over by vengeful spirits, else your neighborhood may be in for five frightful nights! Bring back to life the robotic horrors we all knew at such young ages with this Five Night at Freddy's themed costume and enjoy spreading terror all around your neighborhood this Halloween!